When it comes to advertising on the web, you'll be hard pressed to find a service better for the average web business than Google's PayPerClick AdWords. Google has revolutionized the way web users and web sites connect - making it not only relatively affordable for just about any business on the web to attract views (impressions), but also level the playing field against huge corporations in many ways. Besides Google AdWords, Google also has been innovating itself in many ways throughout the years - forging ahead with tools that further how people use technology – specifically smartphones. Mobile search is growing in leaps and bounds and we are no longer talking about old style WAP internet style technology. Today's smartphones deliver the real live web right in the palm of your hands. To capitalize off this usage, Google has been offering great tools such as Google Maps for its users and Google Places for websites. Now Google will offer another new advertising product called Google Boost. What is Google Boost & How Does it Work? 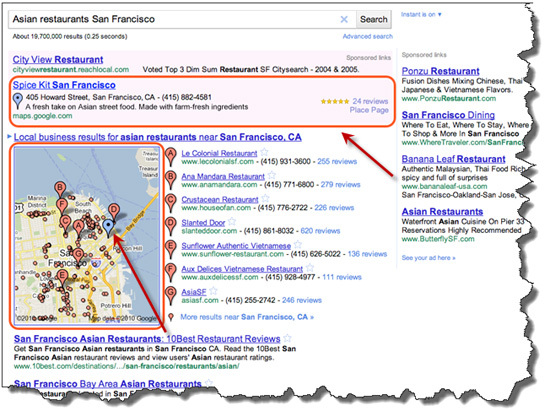 Google Boost is a new ad product that is based on location. With Google Boost, you can now target a specific audience for your website. Similar to AdWords, you can easily target the audience you are trying to attract with two types of keywords: The first type of keywords is verticals (ie: tire repair, tire service, fix a flat tire, etc). The second type of keyword you can target is a location based keyword such as: Friendswood, Pearland, Houston, San Francisco, Chicago, etc. Management of Google Boost is like AdWords; it’s basically automatic. Simply set a budget and Google pretty much takes care of the placement of your ads and the frequency that they are seen by users. As far as your ad being viewed, when a user does a search for a local business that includes a location such as "tire repair Houston", the Boost ad appears in the sponsored links section usually above the map and above normal Google Map listings. Over the last year, Google Maps (and Google Places) have been growing in leaps and bounds. Google has shown its dedication to offering users high quality geo-location data pretty much no matter where they are in the US and the world. A lot of this innovation is actually due to the fact that Facebook is seen as a huge competitor and creating its own ad based geo location product called Facebook Places. Facebook Places is not live yet and the full details are not yet available, but it is safe to say that Google does not want to miss the boat on this geo location opportunity. Obviously, many SEO/SEM campaigns integrate organic search and PPC advertising. For those websites that are location based businesses- a business that primarily caters to a physical community, Google Boost is well worth checking out. Although not in all areas yet, it is still a great time to get ahead of the curve and analyze how this tool is helping clients that are currently or will be using it in the near future. As always, we'll keep you updated on any new announcements dealing with Google Boost as well as how this tool actually works in the wild.